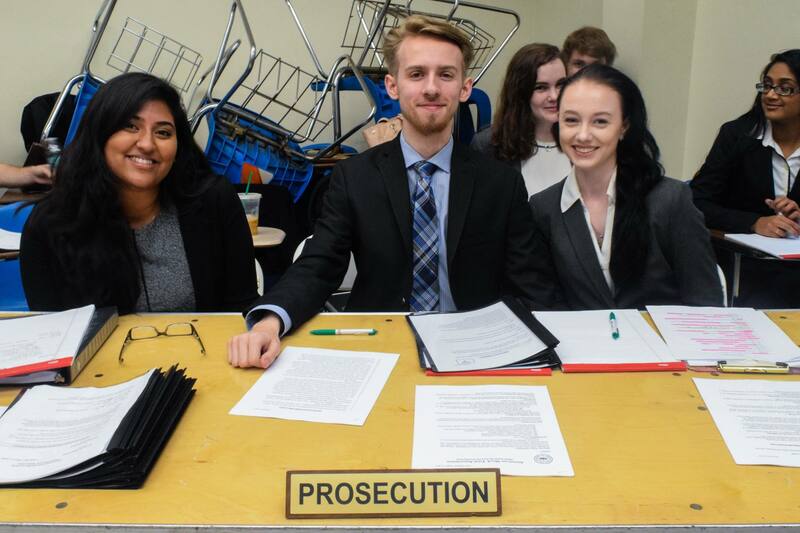 The UMBC Mock Trial Program concluded their most competitive fall season in program history this past weekend with a strong performance at the Yale Invitational. Both UMBC Mock Trial Teams – the “A” and “B” teams – won team and individual awards at multiple tournaments over the last several weeks. On October 14 & 15, 2017, two UMBC teams traveled to Fordham University in the Bronx, NY, for the Fordham University Sapientia et Doctrina IX, one of the earliest invitational tournaments in the country. UMBC’s teams competed unstacked at Fordham, as UMBC Black and UMBC Gold, with returning members and new members competing side by side to build team camaraderie and help new members develop and learn college mock trial. At Fordham, UMBC’s Gold team posted a 7-1 record and tied for first place with New York University, earning a second place trophy by virtue of a strength of schedule tiebreaker. Sophomore recruitment chair Ethan Hudson earned an Outstanding Attorney award as well. Just two weekends later, on October 28 & 29, 2017, a newly stacked UMBC A and UMBC B headed south, as UMBC A made the trek down to Durham for the Duke University Tobacco Road Invitational, and UMBC B competed in Williamsburg at the College of William & Mary Colonial Classic. UMBC A posted a 4-4 record at Duke, and senior Vice-President Summer Akhtar won an Outstanding Attorney award. UMBC B left Williamsburg with a 5-6-1 record – solid results for two teams that had formed less than 10 days before each tournament and faced stiff competition at these elite-level tournaments. Two weekends after Duke and William & Mary, on November 11 & 12, 2017, UMBC A and B reunited to travel together to the inaugural Rutgers University Scarlet Knight Mock Trial Invitational. Both teams had strong weekends, earning Honorable Mention recognition with 5-3 records. Additionally, B team attorney and freshman Sydney Gaskins earned an Outstanding Attorney award with a perfect 20 ranks – only the second attorney in the history of UMBC Mock Trial to win an award with perfect ballot ranks. Finally, UMBC A and B finished the fall season on December 2 & 3, 2017 at the Yale Mock Trial Invitational in New Haven, Connecticut. Universally recognized in the mock trial community as one of the strongest invitational tournaments in the country, the Yale Invitational has an A and B division. UMBC A competed in the A division alongside 23 other teams who earned bids to the 2017 National Championship Tournament last season, and UMBC B competed in the B division with 25 other teams who advanced beyond Regionals in 2017. In the A division, UMBC’s A team finished in 4th place with a record of 6-2, after sweeping or splitting ballots with some of the top mock trial programs in the country. Both teams had strong performances at Yale in the face of challenging competition. The fall season has concluded for UMBC Mock Trial, with four team awards and three individual awards at some of the best fall tournaments nationwide. With the fall season ended, both teams will now turn their focus to spring. UMBC A and B will be in action before the spring semester begins at UMBC, on January 20 & 21, 2018, at the Georgetown University Hilltop Invitational Tournament, and January 27 & 28, 2018 at the Cornell University Big Red Invitational Classic. From there, it’s barely a month before UMBC Mock Trial co-hosts the Stevenson, MD Regional Tournament on February 24 & 25, 2018, where both UMBC A and B will be pushing for bids to ORCS for the fourth season in a row.